We’d love your help. 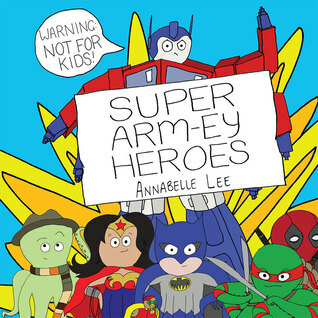 Let us know what’s wrong with this preview of Super Arm-ey Heroes by Annabelle Lee. Super Arm-ey Heroes is the book that answers the question you never knew you had until now: What would cosplay look like at an octopus comic convention? You need wonder no more! Featuring all your favourite super heroes and plenty of villains, Super Arm-ey Heroes is both visually hilarious and obscenely punny. But be warned, saving the world is not for the prudish and this Super Arm-ey Heroes is the book that answers the question you never knew you had until now: What would cosplay look like at an octopus comic convention? You need wonder no more! Featuring all your favourite super heroes and plenty of villains, Super Arm-ey Heroes is both visually hilarious and obscenely punny. But be warned, saving the world is not for the prudish and this book isn't for kids! To ask other readers questions about Super Arm-ey Heroes, please sign up.